From 1775, the Bryngarw estate, comprising the House, formal gardens and adjacent land, was the property of the coal-owning Traherne family. The estate itself originally extended far beyond the present confines and was largely sold off as farmland during the 20th century. The last member of the Traherne family to live in Bryngarw was Captain Onslow Powell Traherne, a stockbroker and industrialist from a very desirable area of London. Between 1910 and 1920 he used some of his wealth to extend the House, and hired the highly regarded firm of landscape designers, Parsons, Partridge and Tudway, to develop an Oriental garden in Bryngarw’s grounds. He introduced many exotic plants and trees, such as the tulip tree, handkerchief tree, magnolias and sequoias which were brought back from his extensive travels around the world. In the late 1940s the estate was sold to a local businessman, R S Hayes. He and his family lived in the House until his death in 1959 when it was sold and acquired by the then Ogmore and Garw District Council and used as council accommodation. The House was converted into nine flats and 32 residential caravans were sited in the grounds. In 1980, Ogwr Borough Council, now in charge of Bryngarw as a result of a local government reorganisation, designated it a future country park and from 1982 reclamation and construction work took place on the site over a five year period. The formal gardens and lake were recovered after 25 years of neglect, a permanent car park was constructed, a network of paths was laid down and public facilities were built. Bryngarw Country Park was officially opened to the public on 23rd May 1986, complete with car park, toilets, cafeteria and children’s play area. Over the past 30 years, Bridgend County Borough Council has continued to develop the park. 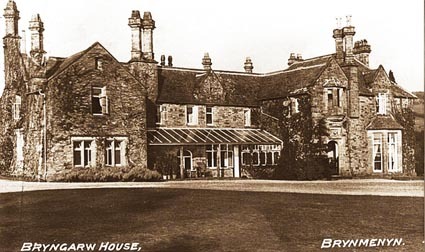 In 1993 European funding was received to transform Bryngarw House into a hotel with 19 bedrooms and, with the addition of the conservatory, a restaurant. It was granted a license to hold weddings and became a popular venue for conferences and seminars. In 2012, a multi-functional visitor centre was built and opened and contains a suite of public facilities including a display foyer, classroom/events space, office for the park rangers, a disabled toilet and café.